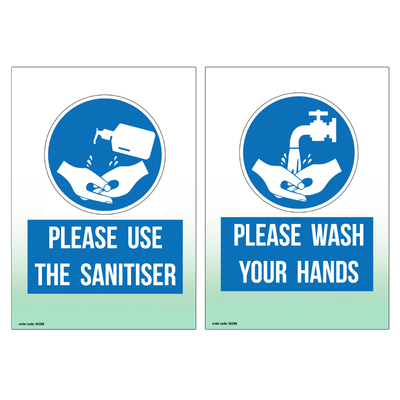 As part of our extensive range of Janitorial Signs, these Gompels Hand Sanitiser/Hand Washing Signs offer a bright reminder to every colleague. Designed to fit inside the relevant holders, these laminated 350gsm signs feature a blue and white design that reminds people to wash or sanitise their hands at different locations around the workplace. Used as part of your cross contamination prevention programme, these lightweight and durable signs are easily wiped clean to ensure they are always legible. Offering an economic alternative to more expensive signage options around, it will work well in every environment from next to the sinks in a kitchen through to on reception in busy care homes. This sign is compatible with both our Black Sign Holder A5. Here at Gompels, we have a wide range of signage options from our Cross Contamination Signs through to First Aid options and even more indepth Hand Washing Posters.